Open yourself up to a deep level of bonding & unfold the medicine between you and your drum. Begin with an the initiation of your drum into the healing world of Shamanism. Shamans connect to their drums in a deeper level, and they are healing tools and connecting with the waves of our voice they intertwining with the voice of the drum. In this workshop we will play with different sounds, rhythms and overtones. Learn how voice also carries itself through the drum. Experience how vibration can move through the bodies energy fields, how blockages are removed and how we can restore, align, and awaken the 5 bodies. We have a tool that can extract energies no longer needed in the body and bring more fluidity to our blood and DNA. As shamans & medicine people the greatest connection is the one with our drum, our voice used with power songs, using this healing tool of vibration energy and sound between shared between our body and our drum. "The Healing Drum Intensive workshop was quite informative and gave me a greater sense of appreciation and respect for my drum. I always loved the sound of drums, but did not know how it should be properly cleansed, nurtured and used for healing of the self and others. Irma was thorough and patient in guiding everyone with step by step instructions and took the time to make certain that each person followed the process correctly. This is key, for those who intend to use drumming as a healing tool in their work." -N.R. 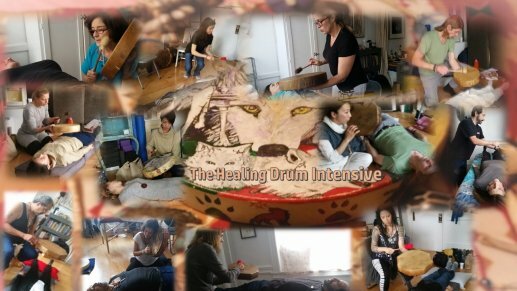 "The healing drum intensive was a good introduction to working with a drum from the shamanic perspective. Irma provided clear instructions, feedback, and supervision during the activities. As a first time drummer, it was easy to follow along. I would recommend this workshop to anyone interested in using their drum to facilitate healing." –D.Z. “Within a beautiful circle, guided by Irma Star Spirit, I learned to drum, not with my hands but with my heart and all of my being! Irma's love of teaching from her heart and her wisdom had me and group drumming in divine harmony - singing and dancing, releasing light and love - healing ourselves and each other. Her drum workshop is a path to fully immersing one's self into the Cosmic essence that flows within all and each of us.”--U.D.M. “The workshop felt like a gently loving yet powerful wake-up call from spirit. Irma and the spirit allies provided a safe space that allowed the natural flow of our voices to run free, each voice connected to the voice of each drum, each drum sound connected to the deepest of our soul, forming a healing circle of love and unity. In silent we listened, in singing we connected. I remember in our circle of oneness each voice was delightfully unique, nostalgic and familiar. We are one. Thank you Irma Spirit Woman for offering a time and space to reconnect”--F.A.